Guitar Blog: Teacher or no teacher - What's the difference? 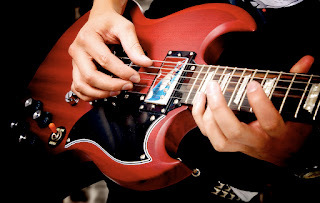 Many people who take up guitar try to teach themselves mostly to save a little money but there are of course other reasons like time and convenience factors. Self teaching is not impossible and there are definitely some examples of great guitar players who are completely self taught so I won't try and convince you that with out a teacher you are doomed. The internet offers students a way of finding many of the resources they need most of which are free and convenient. A teacher on the other hand offers some important advantages that you won't get through self teaching. Most elite sports people, business and political leaders, rockstars, actors etc know this fact. The investment they make in teachers and coaches can run into the millions of dollars in some cases and it is usually money well spent. A guitar teacher is not just about having someone who can show you where to put your fingers. There are a million websites that will do that for you. A teacher offers several advantages. Top of the list is having someone to whom you are accountable. Someone who you have to answer to each week. Someone who will ask the question? Did you practice this week? Usually the more accountable they make you the better. The second most valuable role of a good teacher in my opinion is their ability to help you to focus. Life gets in the way as they say. Your teacher will keep you on track and aware of the distractions most students face. Your teacher has an interest in seeing you succeed and can give you an outsiders perspective. When you depend totally on yourself chances are you will justify skipping practice or just throw in the towel. The next benefit of a good coach is a proven strategy. Why reinvent the wheel? If you are teaching yourself you are learning by trial and error. Why not just find out from a pro what works best and do it right the first time? 30 minutes a day doing it the right way is better than 4 hours the wrong way. A good teacher is like a guide. They should know the best path to get you to your goal or at the very least help you to question your chosen strategy. So if you are not yet a Segovia, Petrucci, Satriani, Gambale or someone of that calibre you may want to reconsider your decision to be a self taught guitarist. I did and in 6 months I progressed more than I had in the previous 3 years.